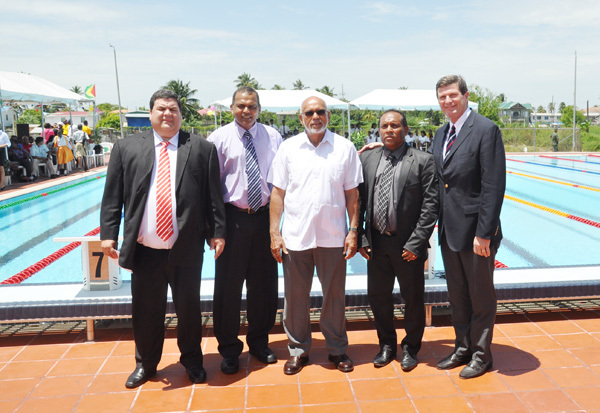 From left – President of Consonat Juan Carkos, Sports Minister Dr Frank Anthony, President Donald Ramotar, President of GASA Ivan Persuad & VP of FINA Dale Neuburger at yesterday’s Commissioning of Warm-up Pool. pool at the National Aquatic Centre and told the gathering, which included Minister of Culture, Youth and Sport Dr Frank Anthony, President of the Guyana Amateur Swimming Association (GASA) Ivan Persaud, as well as FINA Vice-President Dale Neuburger, South America Swimming Confederation President, Juan Carlos Ortheila, Director of Sport Neil Kumar, that the Warm-up Pool was a necessary requirement for International competitions to be staged in Guyana. 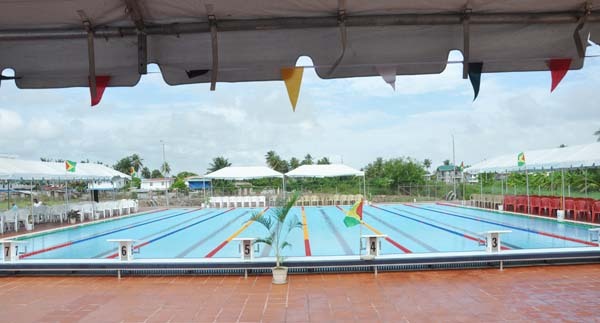 The Guyanese Head-of-State disclosed at the official Commissioning Ceremony that the Government has invested in two world class sporting facilities in the Providence Stadium and now the National Aquatic Centre, while the Athletics track in West Demerara is nearing completion. 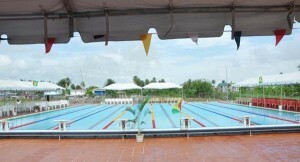 Construction of the 25-metre long warm-up pool began in September 2013 and now complements the 50 meter Olympic-size pool which was commissioned in 2011 by former President Bharrat Jagdeo. Kumar in his remarks said that President Ramotar made good on the promise made by Jagdeo to ensure International competition here. The Warm up Pool at the National Aquatic Centre. Permanent Secretary within the Ministry of Culture, Youth and Sport, Alfred King, in his review of the project pointed out that the addition to the facility is testament to the government’s commitment towards developing sports in Guyana. King said that there were many challenges with the underground work to this pool becoming a reality which caused a six-month delay and an increase in cost. The warm-up pool is 21 metres wide and has a shallow end and a deep end ranging between 1.175m and 1.82m. The foundation for the pool was done by D & S Construction at a cost of $37.3M, while the pre-fabricated pool was sourced from, and installed by Myrtha Pools, the same company that supplied the pre-fabricated structure for the initial 50m pool. National School of Dance perform at the Commissioning of the Warm-up pool. electronic timing system, before the facility can meet the ultimate criteria for an International standard-approved facility. 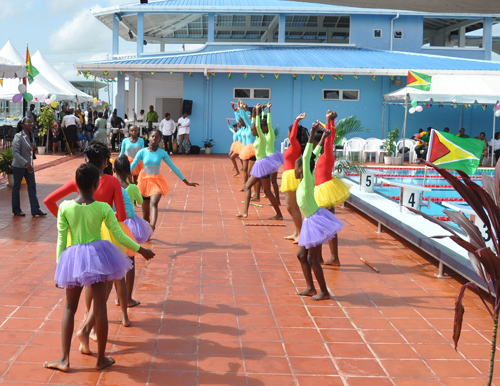 Dr Anthony stressed the importance of exercise and said this facility will now fulfill dreams of Guyana winning an Olympic gold in swimming in the not too distant future since the new facility should encourage improved performances. He also disclosed that he has written the University of Guyana and the CPC in addition to all schools in the area encouraging them to utilize the facility. Members of the public can also use the pool once they do so in a structured manner. Yesterday’s ceremony included interfaith prayers from the three major religious groups in the Guyana, (Muslims, Hindus and Christians), a cultural display, with steel pan music from the National Steel Orchestra, mixed African and Indian drumming, a dance by the National dance troupe, an Aquatic display from some of the national swimmers.